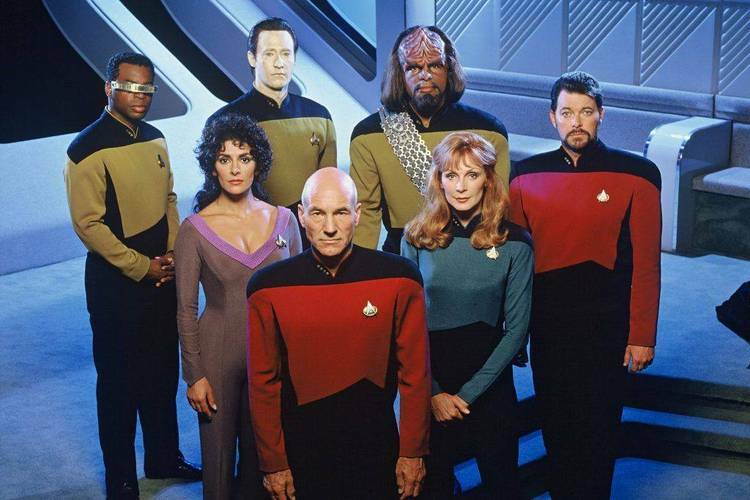 StarTrek Next Generation 1st year episodes. Earth : Mother planet of humanity; most of the Enterprise's crew is from there. Kabatris : Planet where Riker wore fancy robes to impress the native leaders. the USS Enterprise was constructed. something to prevent the same accident and presumably presented it to Dr. Neutral Zone: That area of space between the Federation and the Romulan Empire. Starbase 39 : Enterprise may take the humans discovered on the satellite here. fifth Starfleet ship to carry the proud name. ship was known as the Devo. Aaron, Admiral [Ray Reinhardt]: Elder officer controlled by Parasites on Earth. Bernard, Harry [Philip N. Waller]: A young boy kidnapped from the Enterprise. zens of Bynus linked by an organic computer, known as 11, 00, 10 and 01.
the original ship of the first series. Crusher, Dr. Beverly [Gates McFadden]: Chief Medical Officer, USS Enterprise. father of Wesley and husband of Beverly. Died on a Stargazer Away team. He was introduced to Beverly by Walker Keel. Data, Lieutenant Commander [Brent Spiner]: Operations Officer, USS Enterprise. Very childlike in approach; his greatest dream is to become human. and is trying to teach the android all the basics about being human. Logan [Vyto Ruginis]: Enterprise Engineer, took over from MacDougal & Argyle. in Paris, France. Commanded USS Stargazer; first officer was Jack Crusher. literature, especially detective genre. Does not get on well with kids. Balding, handsome man; attracted to Dr. Beverly Crusher. Quinteros, Orfil [Gene Dynarski]: Base Commander, Starbase 74 (Tarsus III). large, muscular man; has many romantic entanglements. Shimoda, Jim [Benjamin W.S. Lum]: Asst. Chief of Engineering, USS Enterprise. the death of Lt. Yar. Wrenn [Raye Birk]: Leader of the last survivors of Tarellia, and a dying man. the bridge staff; never billeted in credits. Blue Parrot Cafe : A place on Sarona Eight that serves the famous Blue Parrot. Denubian Alps : Simulated by the holodeck, where Wesley and a friend go skiing. Outposts : Planets of the now-dead Tkon Empire that could travel through space. inner symbiotic relationship. The Parasites say they wish to "co-exist"
Repulsor Beam : Also known as a pressor beam, it is a reconfigured tractor. Romulan Empire, The : Vulcanoid species, a major adversary of the Federation. Urselrope Wars : A conflict that evidentally happened within the past 78 years. Allen, Corey -- Director, "Encounter at Farpoint", "Homesoil"
Baron, Michael -- Writer, "Code of Honor"
Barry, Patrick -- Writer, "Angel One"
Becker, Robert -- Director, "We'll Always Have Paris"
Beimler, Hans -- Story Editor; Teleplay, "The Arsenal of Freedom", "Symbiosis"
Bingham, J. Michael -- Writer, "The Naked Now"
Black, John D.F. -- Story, "The Naked Now"
Bole, Cliff -- Director, "Lonely Among Us", "Hide and Q", "Conspiracy"
lore", "Too Short a Season", "Heart of Glory"
Colla, Richard -- Director, "The Last Outpost"
Compton, Richard -- Director, "Haven"
Conway, James L. -- Director, "Justice", "The Neutral Zone"
Davis, Deborah Dean -- Writer, "We'll Always Have Paris"
Duane, Diane -- Writer, "Where No One Has Gone Before"
"Lonely Among Us", "Too Short a Season"; Story, "Heart of Glory"
Forester, Larry -- Story, "he Battle"
Fries, Sandy -- Writer, "Coming of Age"
Glee, Mona -- Story, "The Neutral Zone"
Guers, Karl -- Story, "Homesoil"
Halperin, Michael -- Story, "Lonely Among Us"
Holland, C.J. -- Writer, "Hide and Q"
Freedom"; Writer, "11001001", "Heart of Glory", "The Neutral Zone"
Krzemian, Richard -- Story, "The Last Outpost"
Landau, Les -- Director, "The Arsenal of Freedom"
Lynch, Paul -- Director, "The Naked Now", "11001001"
Manners, Kim -- Director, "When the Bough Breaks"
Mayberry, Russ -- Director, "Code of Honor"
McIntyre, Deborah -- Story, "The Neutral Zone"
Michaelian, Michael -- Writer, "Too Short a Season"
O'Kun, Lan -- Story, "Haven"
Phelps, Win -- Director, "Symbiosis"
Powers, Katharyn -- Writer, "Code of Honor"
Reaves, Michael -- Writer, "Where No One Has Gone Before"
Rhodes, Michael -- Director, "Angel One"
play, "Hide and Q", "Datalore"
Sabaroff, Robert -- Writer, "Homesoil"; Story, "Conspiracy"
Sanchez, Ralph -- Story, "Homesoil"
Scanlan, Joseph L. -- Director, "The Big Goodbye", "Skin of Evil"
Breaks", "We'll Always Have Paris"; Teleplay, "Skin of Evil"
Stefano, Joseph -- Writer, "Skin of Evil"
Strangis, Greg -- Creative Consultant, "Big Goodbye", "Datalore", "Angel One"
Thorne, Worley -- Writer, "Justice"
Vejar, Michael -- Direcotr, "Coming of Age"
Wills, Ralph -- Story, "Justice"
Bough Breaks," "Heart of Glory," "Skin of Evil," "We'll Always Have Paris,"
Now," "Code of Honor," "The Last Outpost," "Where No One Has Gone Before,"
Big Goodbye", "Datalore," "Angel One," "Too Short a Season"
Romanis, George -- Incidental Music, "Too Short a Season"
Steiner, Fred -- Incidental Music, "Coming of Age"
Christina Mavroudis, Richard Taylor and Lee Whiteside.